The following are the 2018 National Brass Band Championship B Grade results. The band di not compete last year and our results this time have improved yet again. This year the set test was Ouroboros written by New Zealand composer Todd Smith and our own choice was Turris Fortissima by Stephen Ponsford. Our special thanks go to the players assisting the band and we look forward to working with you again in the not too distant future. Congratulations to Robbie and band on a great result and a fabulous effort in getting the band to an extremely high standard. 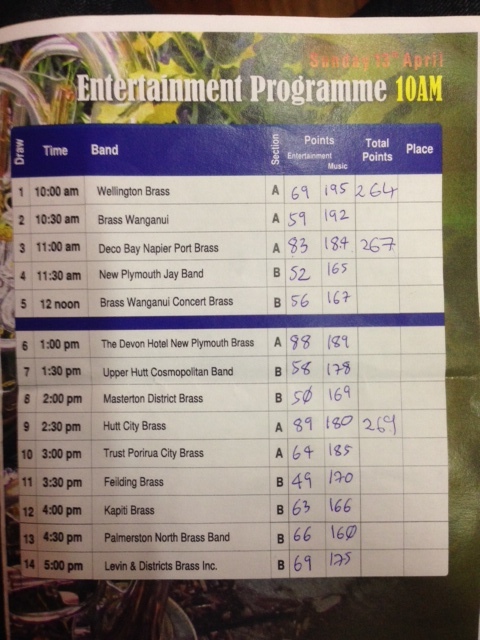 The annual CDBBA contest was held in New Plymouth over the weekend of 26 – 27 August 2017, ably hosted by Devon Hotel New Plymouth Brass. The Chief Adjudicator was Alan Spence from Whakatane, assisted by Barry Cullen. 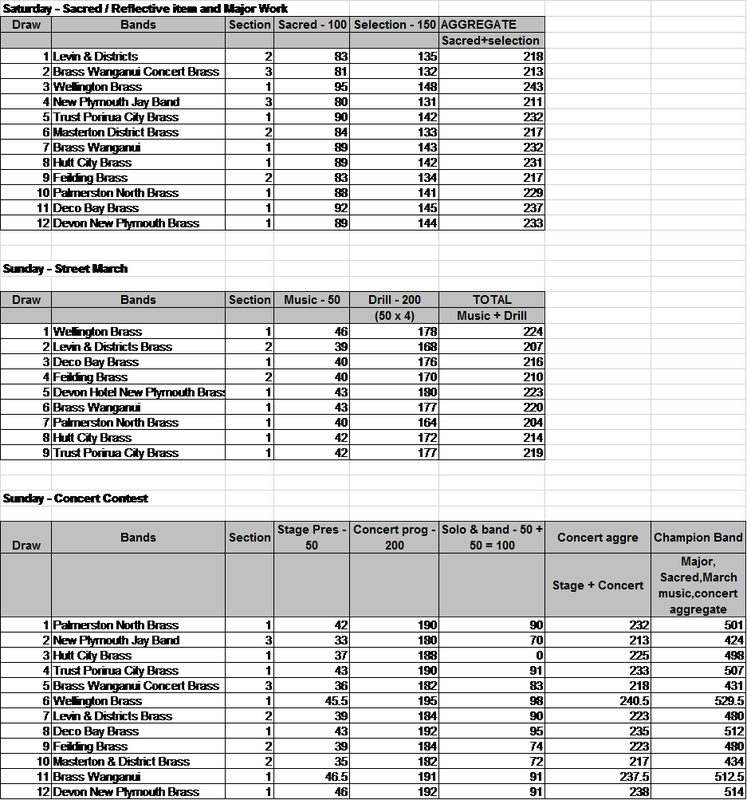 The following are the 2016 National Brass Band Championship B Grade results. This is the second National Contest the Deco Bay Brass have competed in and our results like District Contests just keep getting better. This year we were set a difficult Test, Philip Wilby's Lowry Sketchbook and our Own Choice, Howard Snell's Images of the Millennium. Our special thanks go to the players assisting the band and we look forward to working with you again in the not too distant future. Congratulations to Robbie on a fabulous effort in getting the band to an extremely high standard. The following are the adjudicator scores for each of the days results. This is the third District contest the Deco Bay Brass have competed in as the new entity and the results are Just keep getting better. This year, musically, Deco Bay Brass were second only to Wellington Brass, the current Austral-Asian Champion Band. Well done to Robbie and band on a fantastic effort. Special thanks to our helpers, Mike Ford, John Sullivan and Jason Rodgers, we look forward to working with you again at some stage in the near future. The following are the adjudicator scores for each of the days results. This is the second District contest the Deco Bay Brass have competed in as the new entity and the results are exceptionally good. Well done to Robbie band on a fantastic effort. Special thanks to our helpers, Andrew Large, Kay Mackenzie and Leigh Martin, we look forward to working with you again at some stage in the near future. 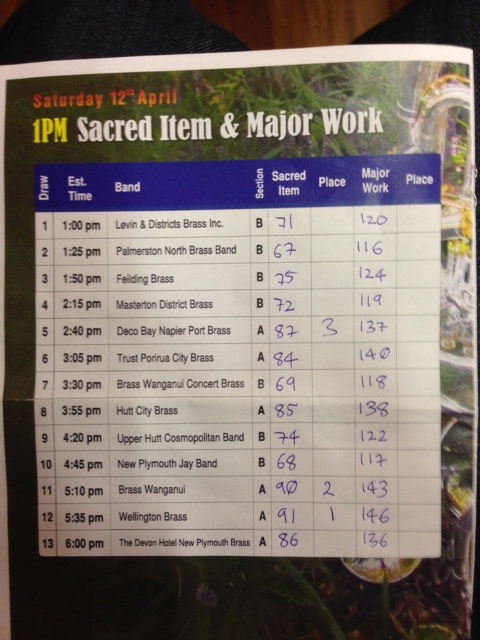 On Sunday 3 August 2014, the Deco Bay Napier Port Brass band competed at the Hawkes Bay Festival of Bands. Whilst not adjudicated in the same manner to which Brass Bands are accustomed, the band performed extremely well. This was the first time both the Contest band combined with the development players in a contest. The band was awarded a Gold Medal for it's performance and Robbie Cargil was placed first in the Solo section of the programme, performing Zelda on Cornet. Well done to all players and Robbie for a very good result. The following are the adjudicator scores for each of the days results. This is the first contest the Deco Bay Brass have competed in as the new entity and the results are exceptionally good. Well done band on a fantastic effort. Sundays Events - Entertainment Programme - Aggregate, 3rd behind New Plymouth and Hutt City.